Not to stereotype, but one of the great things I’ve noticed about Indian cooks is that whenever you make or try out one of their dishes, instead of combing through the ingredients or instructions looking for cultural missteps, they’re always thrilled that you’re interested in cooking their cuisine*. A while back I made Tandoori Chicken, which was one of the first – and only – Indian dishes I have ever made. Sure it’s not very inventive, but it was fun learning about the spices and other ingredients on my trip to the Indian market, and folks left a lot of encouraging comments and tips in various venues for me, offering advice and enlightenment. Instead of saying, “No self-respecting Indian would ever put squirrel cheeks in curry sauce” they might say “My mother never would have put ostrich beaks in her chutney—but it looks fabulous!” or “Leftover marshmallows in a dosa? How creative!” The Indian cooks that I’ve come across have always been enthusiastic that others are exploring their food. In that spirit, I was in the Indian quartier in Paris for dinner the other night and exploring one of the produce stores, and was thrilled to find what looked like tomatillos. My French friends could not believe how giddy I was while I carried home a big bag of them. But that giddiness ended when I got into the kitchen, split one open, and discovered by asking around online that they are actually some kind of green tomatoes. A number of Indian cooks left comments for me on how to prepare them and my favorite was the one that said – “Just heat some black mustard seeds in oil until they explode, then add everything else.” I don’t know about you, but anything that involves exploding mustard seeds sounds like something I want to be a part of. I have to admit that I’m not necessarily on board with this whole ‘green tomatoes’ thing, perhaps because I’m a New Englander. And before everyone chimes in telling me how great they are, channel your inner Indian and realize that people have different tastes and respond to textures differently. In the end, I’m on the fence about green tomato chutney. (Perhaps because I didn’t get to explode my mustard seeds.) Would I go out and buy green tomatoes just to make it? Well, probably not. I do like the little crunch of tomato and mustard seeds, though, and perhaps it just needs to sit and mellow for a bit to tone down the bite, which I think chutney benefits from. I suspect a lot of you may not have any use for green tomato recipes at the start of summer, but when tomatoes are on the wane and you find too many unripe specimens clinging to vines in your gardens, here’s a way to use up all those spares. I did try peeling the tomatoes first, dropping them in boiling water for a few minutes, thinking the skins might be tough. But the skins refused to budge, so I took it as a sign they weren’t meant to be peeled. In the finished chutney, they’d softened nicely so my concerns were unfounded. If you don’t have shallots, use one red onion, thinly sliced.To make sure to stir continuously during the last few minutes of cooking, just to make sure nothing burns as the chutney turns jam-like. I’d didn’t preserve them in jars using any canning method, figuring I’d eat it within a month or so. If you want, there’s a link at the end of the recipe for more information about canning chutney. 1. Mix together all the ingredients in a large, non-reactive pot. 2. Bring to a boil, then reduce heat to a low boil and cook, stirring frequently, for 45 minutes, until the mixture is thick and jam-like. 3. Once finished, ladle the chutney into clean jars. Storage: Chutney will keep in the refrigerator for about one month. Note: Non-reactive means one that is made of a material that won’t react with something acidic, such as stainless steel or glazed enamel. Wait a second, why DIDN’T you explode your mustard seeds??? I don’t know if people add oil to chutney to fry the spices in, unlike a lot of other Indian dishes, which begin by frying the spices to bring out their aromas. But if there are chutneys that do have oil in them, I would try that next time. Not to rain on your parade but the mustard seeds don’t “explode”. Heat some oil. When it shimmers, toss in the mustard seeds. They will “pop” like in popcorn not explode. Sure, you’ll have to clean up your stove but you do that for Italian tomato sauces too, right? My mother would have most certainly exploded those mustard seeds first! More seriously though, I often add a wee bit of oil to a small pan, comme ça, for purposes of spice explosions, and then add it to the main pot. It really does make a huge difference to flavour. My mother would have most certainly exploded those mustard seeds first! More seriously though, I often add a wee bit of oil to a small pan, for purposes of spice explosions, and then add it to the main pot. It really does make a huge difference to flavour. Bon weekend! Crazy Chef: It was likely meant more figuratively than anything else, because sizzling spices and seeds in oil provides an “explosion” of flavor. Curry: That’s a good idea – and I am going to try that next time. It makes sense to get as much zing out of the mustard seeds as possible. If you have a tall-enough pot, then you don’t even have to clean up. Yes, you are right, that’s exactly the attitude of my family members and friends in India and in Indian community here in the UK. In fact, my mum’s website, Mamta’s Kitchen, is based on the premise of sharing family recipes with friends and strangers alike and she is constantly encouraging readers to experiment and tweak recipes to their tastes, to what ingredients they have to hand and to what takes their fancy! I had a lot of green tomatoes left over in 2009, as we didn’t have enough sun to ripen them, so I made up a recipe for green tomato chutney according to what I had in the house. It turned out to be one of the best I’ve ever made! Green tomatoes are awful if you try to eat them raw or half cooked. I’ve never had them completely cooked, so I can’t be more creative than your friend in comparing them with a body fluid o anything else :) However, they are absolutely amazing pickled -either whole or diced. The greener, the better they will keep their shape and remain crisp longer. And yes, I put mustard seeds, among other spices, to flavour the brine, but they don’t pop nor explode. Thanks David, for the recipe, I’m always looking for chutney recipes, as I love the stuff!! Going down the list of ingredients on the chutney, I think I’d love this. I’ll give it a go when summertime comes again to Oz. I’ve made curried green tomatoes at the end of the season — a warm side dish that goes well with grilled chicken or fish. I have a boatload of green tomatoes on the vine in my garden now. If it looks like the deer or rabbits will get to them before they ripen, I might be trying this chutney fairly soon! Never had green tomatoes too, only tomatillos, wich I bought a batch of yesterday. I’m on for tacos and green salsa. Anyway, I would probable try your chutney, I like these things! I love green tomatoes – the spicy cornmeal fried version – but haven’t had a huge amount of success with other green tomato recipes. This one does look interesting though. May have to try it in September. Merci, David! I know you’re a great pastry Chef, so to venture outside of your comfort zone to make Chutneys is commendable! Now if I can only start baking more! 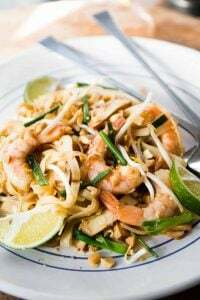 The combination of brown sugar, ginger and chiles with the green tomatoes and onions sounds like an amazing “chow-chow” which is a pantry staple in many ,if not most, Southern homes. Last summer I grew cherry tomatoes in my backyard and ended up not getting to eat any–my (then) 2-year-old son nabbed every single one! If there wasn’t a ripe red one on the bushes he wasn’t deterred, he went after the green ones with just as much gusto. I think I like the idea of chutney better. 1. Heat the oil in a pan until it is very hot. When you pass your hand on top of it, you should feel some serious heat coming off of the pan. 2. 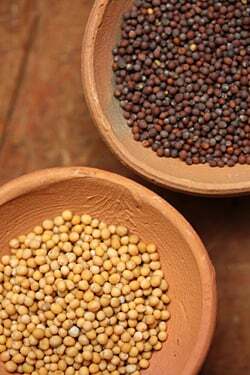 In one hand hold a little bowl with your desired numbers of mustard seeds, in the other hold the lid to your pot. 3. Quickly add the mustard seeds to the pot, and cover the pot leaving the lid slightly ajar, to decrease the amount of condensation that occurs. After you do it a couple of times, you’ll get used to it. Popping the seeds does make a huge difference. When I was still learning how to do this, I would add the seeds when the oil wasn’t quite hot enough, and they would get “oil-logged” and not nearly as toasty and tasty as when the oil is sufficiently hot. I do think you will really enjoy the difference in flavor! If you’d like to not have to deal with the two hand method, you could easily use a splatter screen to prevent those pesky mustard seeds from escaping. 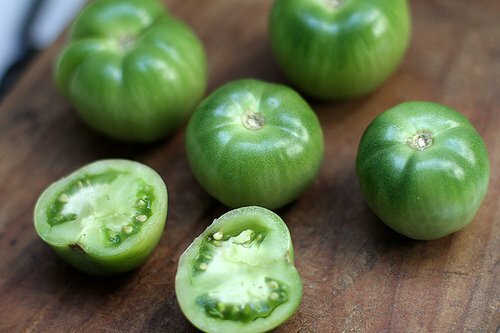 Have you checked out the fried green tomatoes recipe? Definitely explode the mustard seeds sometime, just for the experience! I know you mentioned you weren’t blown away by tandoori chicken (neither am I), but if you like the general flavor palette you should try butter chicken (chicken makhani), its pretty yummy. Great looking recipe.. living by the rocky mountains our evenings are cool and the tomatoes don’t like this, so tons of green tomatoes when frost come.. I have had all my tomatoes freeze in an unexpected frost years ago. My girlfriend found a green tomato mincemeat recipe and we canned all our frozen green tomatoes with excellent results!! Thanks for this recipe! Try this one. It’s fabulous. Cut tomatoes in half and squeeze out the seeds. Cut halves into thin slices. Put into large glass or china bowl and sprinkle with sugar. Marinate for 24 hours. Next day cook over low flame in heavy pot with lemon rind and juice for 2 hours (yes, 2 hours). Stir from time to time with a wooden spoon. In Cuba, they serve raw green tomatoes with a splash of lemon and oil as a side dish — they are delicious! Back home in Quebec, we make a green tomato ketchup which is a must with our tourtière (meat pie). They sell it in all the grocery stores. My Indian mother-in-law is always saying “try it! might turn out nice!” so I know what you mean and I love that spirit too. One word of advice on mustard seed oil (as someone mentioned in the comments) you need to really really heat it good or it doesn’t flavor correctly. It makes the entire dish bitter/not taste right if you don’t get the oil hot enough. I’ve yet to master mustard seed oil, but I think done right it does add that distinctive Indian flavor to many dishes. Next time, how about saving a few for a simple southern squash dish: sauteed sliced green tomatos, yellow summer squash and some nice onions. I like to slice mine in wedges, so they aren’t as chunky as otherwise might be. Add a little butter (I said SOUTHERN, didn’t I?) and salt. The green tomatos perk up the squash and the entire effect makes me seek out green tomatos. 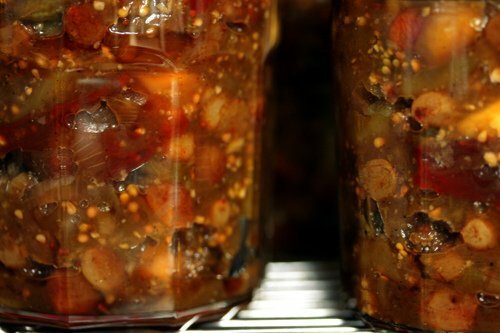 I had the most wonderful green tomato chutney about 20 years ago in Provence. It was more sweet than this recipe an had split vanilla beans. It was served with toast for breakfast. A year later I tried to make it myself, but it wasn’t nearly as good. You have inspired me to try again once I can find some green tomatoes! Personally I have been craving some half-sour picked green tomatoes and as such am jealous of your haul. Thanks for all your great recipes! Exploding mustard seeds!! I have GOT to try that. Maybe I could get them to explode with a kitchen blowtorch, hence convincing the husband that I *need* a kitchen blowtorch. A win-win! I’m with you on the green tomatoes; not a big fan. But since I can never successfully grow a tomato without blight, whitefly, a plague of hornworms or deer attack, I guess that’s a good thing. Thanks for the link-love! That curried apple chutney is a crowd favorite. Just think of how much better it’s going to be with exploding mustard seeds. I once made several jars of papaya chutney. My husband’s sisters had a papaya tree in their yard in Edinburg, TX (on the border of Mexico). They gave me this huge ripe papaya. It had to be eaten, fast. 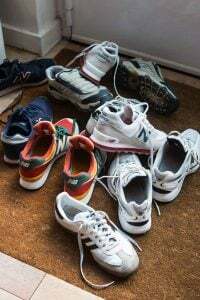 I lived alone at the time. I am not a big fan of raw papaya (I think it smells like feet). But it seemed valuable, this backyard fruit. 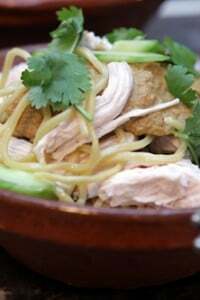 I found a chutney recipe similar to this, but with fresh ginger and no orange peel. Also, I think it had honey or brown sugar in it. I loved the chutney, it’s vinegar ans spice– we put it on toast with cream cheese, served it with curries and rice. I still dont like ripe papaya without other fruits, but I love this chutney!! I come from the land of exploding mustard seeds and loved this, very creative! David I love your photography. Your chutney is spectacular looking but would love to know how it taste in a few weeks. Please do a follow up post if you remember or I will send an email to see if the flavor mellowed. I know folks who swear by green tomato chutney, but it’s never really thrilled me. At this time of year, I’m anxiously awaiting the ripening of my delicious red tomatoes, and then by early fall, I’ve over-consumed and am pretty ready to be done with tomatoes for a while. When I was growing up on a farm in Ireland we made green tomato chutney and apple chutney from left over tomatoes which would not ripen. We made it with malt vinegar and would keep for at least three months before eating. 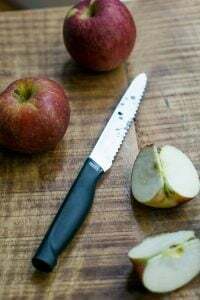 Cider vinegar is more mellow but keep chutney force while before eating. Chutney correctly made and sealed will keep for years! We never fried the spices . These recipes are more from the Anglo Indian tradition than true Indian indian pickles are made differently. You can make a chutney from nearly anything ! Just a quick note to say that I went to one of a series of chef presentations outdoors looking at the harbor at the ICA (Institute of Contemporary Art)in Boston. The first “starred” Joanne Chang who was terrific, showing us how to make a pâte brisé and adult “pop tarts” as well as delicious lemon scones. There was a Q+A afterwards and someone asked who had inspired her and YOU were one of the 3 chefs/bakers she mentioned, so congratulations! Yay David! A little bit of the “when life gives you lemons, make lemonade.” I am so tickled that you used an Indian-inspired way to do it! That rocks. Motor on, dude! Cheryll: Thanks for that recipe. I really like that book and I think it’s out of print. Next time I get some green tomatoes, will try that out. Gene: I think “Asian” tends to get lumped together for lack of a better term. (It’s like when people in Europe say to me, “You’re not like all the other Americans we’ve met”, as if we’re all the same.) For lack of a better broad term, that’s how I used to cook rice for Asian dishes before I got my rice cooker (one of the best kitchen tools ever). It’s always hard to appeal to all the different tastes and cultures on a blog because the audience spans such a vast swath of people. Thanks for your thoughts! Jackie: I think all of us bakers tend to be influenced by each other and we talk and share, and that’s the nature of it. I’m glad Joanne is doing so well with her bakery and book, and need to get to Boston someday to taste for myself. Gina: That’s interesting they eat them raw in Cuba. It reminds me of a recipe I saw for raw citrons, sprinkled with sugar. They’re hard and pretty bitter so I can’t imagine eating one, as they apparently do in Tuscany. Glad that you’re exploring Indian cuisine more! And don’t feel bad about thinking those green tomatoes were tomatillos…I did the same when I saw them for the first time on a recent trip to Rue Faubourg Saint Denis, and I’m Indian (I’m also Texan and am sick of toting tomatillos across the Atlantic)! My husband loves green tomatoes and I like the very ripe ones. So i buy them green for him and allow them to get ripe for me. We also enjoy Indian food and the variety of ingredients they use, but I find it very hot for me, at least the ones I’ve tried in local restaurants in Boston. Almost like Mexican cuisine. I really wish my stomach would tolerate it. Thanks, I truly enjoy your site. What a treat, even if I don’t cook too often anymore. but..why not make Fried Green Tomatoes with them? My question is, if they were in a french market how do the french prepare green tomatoes?? Now you’ve got me craving Indian food, guess I’ll have to get out the spices! While I might not use oil in a “chutney”, there is such a thing as an oil pickle which is common in India/Indian diasporic communities. These can be sweet/spicy/pungent. A not-surprisingly very good take on oil pickles is in Chris Schlesinger, et al’s Quick Pickles. Here’s a good article/review of the book with quite a few recipes included: Pickle This. 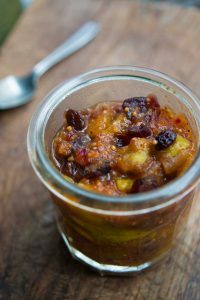 Scroll down for the mango pickle recipe–I’ve used green tomatoes after scooping out the green gelatinous seed area. I made chutney with green tomatoes but did not use apples at that time. It was kinda runny. This looks like good, ol’ chunky chutney! Looks great to me. iits called Tadka. (the exploding of the mustards ) It functions as the tempering . Sorry to bust a common western misunderstanding, but what you have made is more of a pickle than a chutney.In the strict sense, Chutney, is essentially a bunch ingredients ground or mashed to pulp, and eaten like a dip. Its taken a whole different meaning outside india. GREEN (unripe) tomatoes are definitely not a common everyday cooking item even in india. Wonder who would buy them in paris. Almost 99.99 % of indian dishes dont require peeling/de seeding/ blanching the tomatoes. So dont sweat over it. 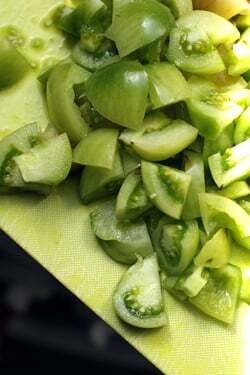 Last October, I had an abundance of green tomatoes leftover from clearing away the tomato plants. 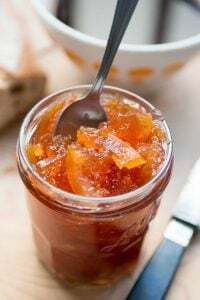 It seemed such a shame to throw out the unripened fruit that I made green tomato jam (flavored with cinnamon, cardamum, and cloves), which I then gave away to friends and neighbors. Everyone liked the jam and said that it paired nicely with cheese and crackers. Your chutney looks fabulous. My tomato plants are full of green fruit, but I am still trying to be patient for them to ripen. 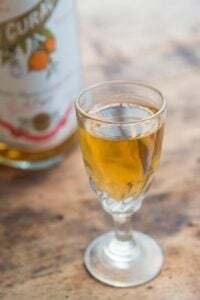 I would like to try this recipe at the end of the season when the days start to cool. Thank you for linking to my mango chutney- it is a favorite in our house. Are you all talking here about unripe tomatoes or a variety of tomatoes that is green when ripe? These are green, hard, unripe tomatoes that I used in this recipe. Does anyone have a lead on a copy of Usha’s Pickle Digest? It’s become something of a holy grail for me. The first thing that came to mind when I saw the mustard seeds, red chilis and urad dal (lentils) was one of my favourite ways to eat vegetables – poriyal! My family is from Madras, and this dish is the most basic way to eat vegetables over there. It starts off with the tadka (as Laya noted): heat oil, add ground asafoetida, mustard seeds, lentils, and red chilis, let it splutter a bit, then add cooked/semi-cooked chopped veggies and salt. Once the veggies are cooked through, add grated fresh coconut, stir through, turn off the heat, and add chopped coriander to garnish. Do not miss out on the asafoetida – it gives it a great smokiness. My favourite veggies to cook this way are carrot and beetroot, but you can pretty much throw in any vegetable (try sweet potato – it ends up tasting like bacon!). The chutney looks delish! I bet if you pureed it down, it would be a great spread for chutney and cheddar sandwiches (who can resist those?). Have you tried Indian-style green mango chutney? Do a google search of ‘mangai pachadi’ – trust me – you will be addicted! Where ever is the Indian quartier of Paris? I always end up going to London to eat Indian. And while we’re at it: where to buy spices there? 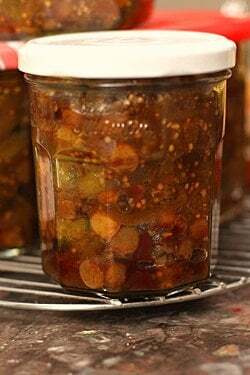 Wow David, this looks very similar to a chutney recipe I made one cold, sunless summer when we had tomatoes risking frost on the vine long before they had a chance to ripen! However it required a LOT of cooking-down, so in the end the components break down into more like a thick sauce, and the flavour was very concentrated and rich: sour and sweet and spicy all at once, and delicious! We jarred it up and served it all winter long with rice and daal, and it lends the whole plate a refreshing and flavourful counterpoint. I’m glad you found a use for those green tomatoes in a way that expands your cooking horizons – and as a bonus, chutneys are a great way to preserve summer bounty! MB: The Indian shops are clustered around the area behind the gare du Nord. One particularly large épicerie is VT Cash and Carry, 11-15 rue de Cail (M: Stalingrad) But it’s fun to explore all the smaller places as well. Great post! I’m mostly excited because you were so excited about mustard seeds exploding! Love your enthusiasm and you writing about this will make others want to try and make Indian food, so thanks! In almost every class I teach, I teach tadka (as Laya and a few other commentators stated). It’s a fun technique for everyone and a great way to start the class. I agree with all the other Indian comments above regarding chutneys vs pickles, tarka tips, etc… Good info! I love reading your blog and books. 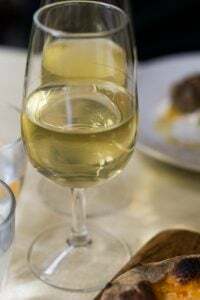 I know you are not a fan of food ‘swimming in lots of liquid’ but you should explore Indi food some more. Try out some kebabs. 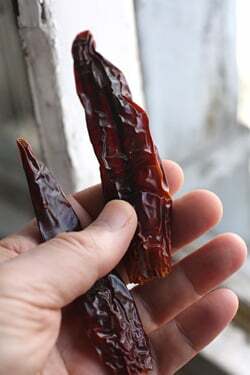 They go exceptionally well with green chutney made from Coriander, Mint leaves, Raw mangoes, green chillies and lemon. 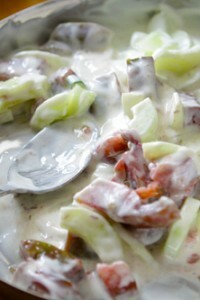 To make it a little mild you can mix the chutney in yoghurt to get a raita. Late in the fall, green tomatoes take over the Roman markets. They are good as a salad on their own — especially the ones with a rosey hue — they add body to chicken soup, and they also make a nice, somewhat tangy ragu for pasta: Lightly crisp a small amount of pancetta in olive oil, add a smashed clove or two of garlic and some chopped shallot or onion along with a bay leaf and a bit of fennel seed. If you want a richer sauce, crumble in some mild pork sausage. Cook the sausage until it is no longer pink, but don’t let it brown. Add a lot of roughly chopped green tomatoes, salt and pepper, and cook into a sauce over medium heat. Toss with penne, ziti, orecchiette, or other shaped pasta. Finish with parsely, lemon zest, and black pepper. 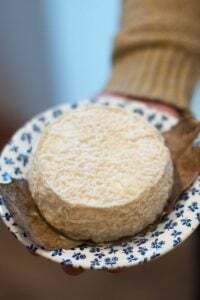 Drizzle each serving with olive oil and flock with grated pecorino cheese.